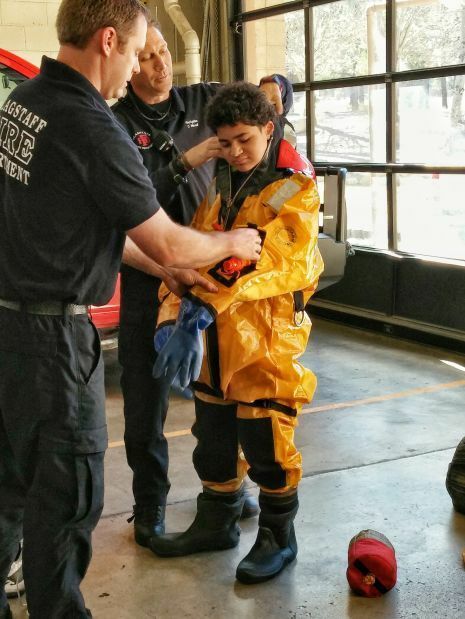 Flagstaff firefighters help Jaden Shepherd, 10, try on one of their ice water rescue suits Sunday during a tour of Flagstaff Fire Department's Fire Station 4. The Flagstaff Fire Department gave Jaden the Citizen Heroism Award for rescuing his grandparents and their dogs from an icy lake in early January. (Left to right): Firefighters Casey Wood and Mike Felts, 10-year-old Jaden Shepherd and engineer Todd Dobbs show off Jaden's Citizen Heroism Award at the Flagstaff Fire Department's Fire Station 4 Sunday. A 10-year-old boy is being called a hero after he rescued his grandparents and their two dogs from an icy lake. The Flagstaff Fire Department presented Jaden Shepherd of Phoenix with the Citizen Heroism Award during a surprise visit at his grandparents’ Flagstaff home this Sunday. Jaden was visiting his grandparents in Flagstaff on Jan. 3 when they decided to take the dogs on an afternoon walk in the snow on the golf course in the Country Club Estates neighborhood. Suddenly, the dogs spotted a large flock of geese by a nearby frozen lake. They bolted toward them. Jaden and his grandparents instinctively ran to help the dogs. The ice gave way beneath them, sending all three people into the frigid water. At first, Jaden tried to push his grandparents’ dog, D.O.G., out of the water, but the weight just made the boy sink lower into the freezing lake, so he tried a different approach that he had seen on an Animal Planet program. Jaden’s grandparents were still struggling to get out of the water. It was so cold that Jaden’s grandmother thought she was going to die. Jaden next managed to pull his grandfather out of the water. As his grandfather went to help Marilyn, Jaden turned his attention to the other dog, Sienna, who kept dipping below the surface of the water. After everyone was finally out of the lake, they carefully made their way back to solid ground. The whole ordeal lasted less than five minutes, but to Marylin, it felt like hours. She described herself as being in shock. “Jaden at one point said to me, ‘Grandma, are you dying?’” she said. They were bitterly cold, but no one, including the dogs, was seriously injured. “Everyone luckily made it out safe and here we are alive,” Jaden said. Marilyn wrote a letter to the Flagstaff Fire Department detailing her grandson’s heroic actions. Fire personnel agreed. 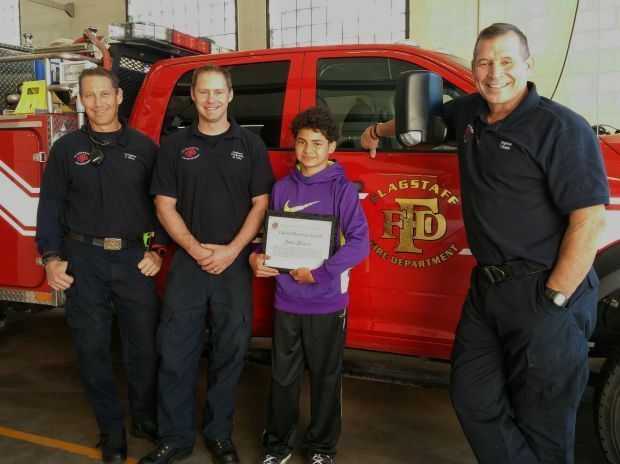 After surprising him with his award, the crew members of Flagstaff Fire Department Engine 4 gave Jaden and his grandparents a ride in their fire engine and a tour of Fire Station 4. Firefighter Mike Felts said Jaden’s cool head was what saved him and his family from dying of hypothermia or drowning. Felts said anyone whose pet falls through the ice should call 911 immediately rather than risk becoming another victim. He recommended that anyone who does fall through the ice shout for help and try to remain calm. Prevention, he added, is the best way to stay safe. For Jaden and his family, it is a lesson they won’t soon forget.